You will not find a more energetic and charismatic frontman that brings the audience and the band together than Arsenal’s Alby Miller. Alby began his musical journey as a drummer. Early in his career, his destiny changed when he was asked to handle vocal duties for an emergency fill in gig. 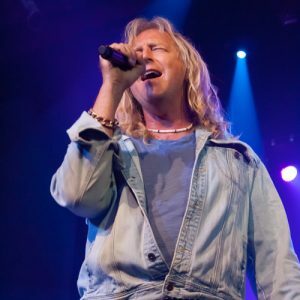 Alby’s incredible vocal range enables him to perform 70’s & 80’s classic rock tunes with the spot on precision needed for covering artists such as Journey, Pilot, Boston, Foreigner, Kansas, Loverboy, Def Lepard, The Baby’s, Nick Gilder, Sheriff. Alby’s been on the regional and national music scene for over 25 years, not only as a musician and vocalist but also as an in demand audio engineer.